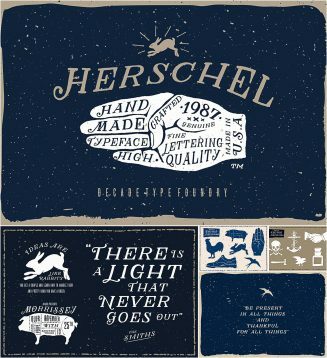 Introducing Herschel – unique hand drawn serif, inspired by the natural imperfections that occur in traditional sign writing. You can use Herschel in any setting; children’s books, beer labels, organic food packages, menus etc. Tags: lettering, packaging, poster, retro font, serif, tattoo.